Every once in a while, people are asked to make an important choice between two people, one that will have a serious effect on the world for years to come. That choice came earlier this week, when the season finale of The Bachelorette took place, and JoJo Fletcher’s decision—Jordan or Robby?—shaped the future of what we’ll see on the cover of People, potential ongoing reality spin-offs, and clunky ad campaigns for the foreseeable future. Luckily, she chose the slightly less appalling option, Jordan, meaning Aaron Rodgers’ younger brother will now be a part of the tabloid landscape for at least a few months, possibly until he opens a few football-themed restaurants in Chico, California, or something. But America will not stand for having something like that decided without our input. Therefore, despite its utter lack of impact on the show, JoJo’s feelings, or any other factor, Bachelorette fans made their voices heard. 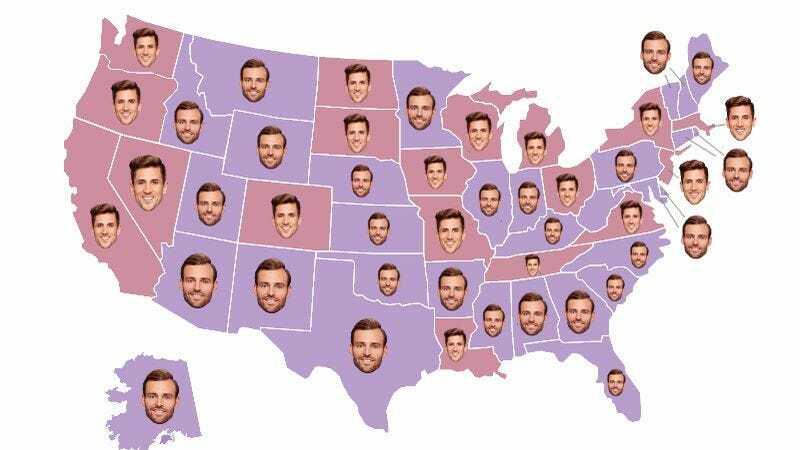 Social media site Rantic.com surveyed more than 10,000 Bachelorette fans—roughly 200 per state—through a Facebook platform, in order determine which states voted for which finalist. The results may give you a fleeting diversion in the steady march toward death we’re all trying to forestall via any means available! Some of the results of this electoral college-style assessment are unsurprising. Jordan carried his brother’s football homeland of Wisconsin, while Robby took home victories in rival states Minnesota and Illinois. (What is wrong with you, fellow Illinoisans? Robby is the worst. Have you seen his shameless self-promotion on social media? It’s awful.) But while Robby took home more states overall, if we extend the “electoral college map” thesis, then it sure seems like Jordan just might claim the throne. It’s probably his narrow win in Hawaii that pushes him over the top. That being said, we’re done with both of these guys now. Give us Wells or James T. any day of the week.